The Murderous History of Bible Translations by Harry Freedman is a concise, entertaining, and informative look at the history of Bible translations over time. It covers both the butchering of language in translation and of those who dared translate the Bible in the past. Freedman's work is a very solid read that highlights the ebb and flow of controversies that have arisen in translating the best-selling book of all time. 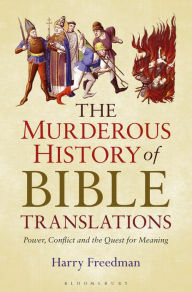 The author covers the chronological spectrum of Bible translations, starting before the time of Christ with what is now the Old Testament, continuing through the early era of Christianity, and then the subsequent violence that gradually arose as scholars tried to translate the Bible for the masses against the wishes of those who thought they knew better. Bible burning became a noted pastime and "tradition" of sorts among those who either tried to suppress increased access to the book, or simply had an axe to grind against how a particular version was translated. In addition, Freedman talks about lesser known translations and how they came about as a result of some form of discrimination or in a couple of cases, as a way for a particular culture to gain a better understanding...while leaving others confused as a result! The combination of historical background, controversy, and the introduction of individuals that are rarely heard about makes for an informative story about humanity's struggle with and against the Bible. If you have a background in history, religion, or sociology, this book is definitely for you.